Annual Day of Mahatma Night Degree College was held on 19th December, 2018 at Fine Arts Hall, Chembur. The annual day program started at 5 p.m. with Ganpati Vandana Dance performed by Divya Ambire. This year night Degree college selected a unique theme of Dance of different states. 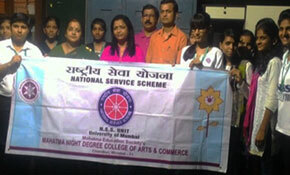 Students performed daces of the states of Maharashtra, Bengal, Gujarat, Jammu Kashmir, Uttar Pradesh and Tamilnadu. After the dance performance of states funny dance was performed by Deepak Mourya and group. Students enjoyed the dance performance of the night degree students and they also started dancing in between. The final performance was given by F.Y.B.Com. students. The entire program was anchored by T.Y.B.Com. students of Wajid Ali and Sheetal Dasri. 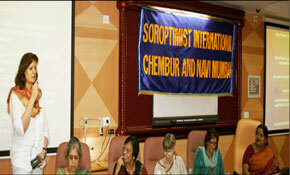 The program was over by 6 p.m. and formal vote of thanks was proposed by Taruna Patel Madam. Group Photos were taken at the end of the program. The third activity of the Cultural Committee was ‘Annual Day Celebrations’. As the college building was on total renovation, this year we conducted the ‘Annual Day Celebrations’ of all the Institutions together, in the Fine Arts Society Hall, Chembur on 4th January, 2010. 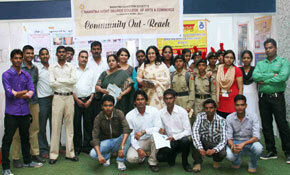 The students from our college also presented colourful items. This year there was no competition involved in the celebration. But it was a visual feast by all means. Before the happy mood of Annual Day faded, the fourth activity of the Cultural Committee organized Pink & Blue & Chocolate Day on 6th January, 2010 during the last period. The most prestigious activity of the cultural committee every year is organizing a grand send off party for the final year students. This programme is always sponsored by the Management. Generally the second year students give all moral and physical supports for the success of this programme. Students’ Council members took the lead and all the arrangements were done by the Cultural Committee. This academic year more enthusiasm was found in the participants and organizers. The Representative from management, library, administrative section, the Principal, faculty members and a group of alumni were present. All the speakers wished the final year students the best result and future. Our ex–student Mr. Zarapkar, who is a professional comparer and musician entertained that session. Games were also a part of the nite. This programme was followed by a smart veg. and non–veg. dinner.